The new book is available for purchase thru the publisher and Amazon.com. Be sure to order your copy today. 'Memphis Wrestling History Presents 1967 Programs Is Now Available! This book was exclusively available atwrestling events and conventions, now this book has finally been released online. MWH's latest book is a one that looks back at the programs from Memphis during 196. Also included are the weekly results newspaper clippings. The weekly Memphis cards tool place at the Ellis Auditorium. Take a look back at some amazingly rich wrestling history that took place 50 years ago. 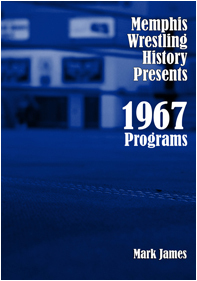 Memphis Wrestling History Presents 1967 Programs (192 pp.) is available now! It is priced at $22.50 and is available in print at AMAZON.COM as well as the publisher's WEBSITE. For our international fans, please go HERE to order your copy of his book. The author is available for interviews and book signings.